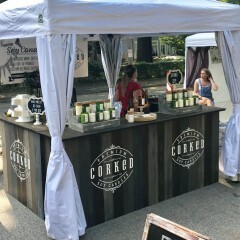 If you missed the Grant Park Summer Shade Festival then you missed the premier of our newest soy candle. Not only did we introduce our newest (and a top seller this weekend) Wine Cellar scent, but we sold out of one of our seasonal favorites, Fall Y'all. We believe it may have had something to do with our new booth display, but in all truth it was due to the wonderful people at this event. 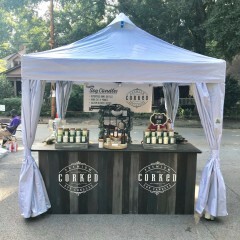 Erica and I were so excited to set up our new display at the Grant Park Summer Shade Festival. When Erica had the idea to redesign our booth to resemble a wine bar, I was all in. Our candles as you may know are hand cut from re-purposed wine bottles enjoyed by friends and family. The Grant Park Festival was packed with such great vendors and creative people that voiced accolades on the design of our new booth. Not only was the booth functional to work in, but it has a clean non cluttered look (if I do say so myself). 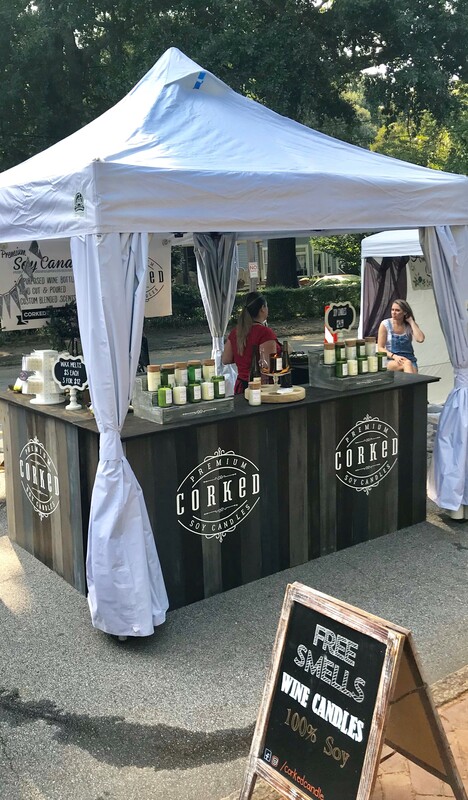 A few months back the idea began with a picture of an actual outdoor wine bar that Erica came across. So, last week my husband and I began the construction. It had to be lightweight and portable because Erica and I are typically the ones loading, unloading and setting up by ourselves. It also needed to look like re-purposed barn-wood because of course we are all about recycling. The problem with barn-wood though is it can be very heavy. So I used my skills with faux painting and hand painted thin plywood. Now our beautiful hand made Soy Candles in recycled wine bottles have a new home. This was just a small part of the fun and excitement we had at Grant Park Summer Shade Festival. As mentioned before we meet some very talented and creative people, so much so I just had to purchase this amazing one of a kind ceramic box from a local UGA grad. 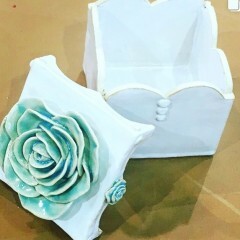 She can be found on Instagram @aproctorceramics or Click HERE. She also has an Etsy store HERE. As always you can find us here or check out our Upcoming Festivals HERE and come see our new booth in person. Don't forget we just released a new Super Sample Pack so you can test out all our scents.